Curlew Cottage near Bellingham, Northumberland sleeps 6 people. Curlew Cottage near Bellingham has a hot tub and indoor swimming pool situated in the adjacent farmhouse garden, and magnificent views over the Northumberland National Park; this is a spacious, eco-friendly, semi-detached converted barn. Each of the bedrooms have their own Smart TV, there is a large, cosy multi-fuel burner in the living room and fantastic views, you won’t want to leave. The wet room even has the added benefit of a LED heated mirror. However, when you do venture out, there is easy access to main roads to reach Bellingham, only a mile away, with a choice of pubs, cafés, golf course and local amenities. The owner can even arrange private fishing for two people on family land. Set on a working beef and sheep farm, the owner’s will be delighted to show you the lambs. 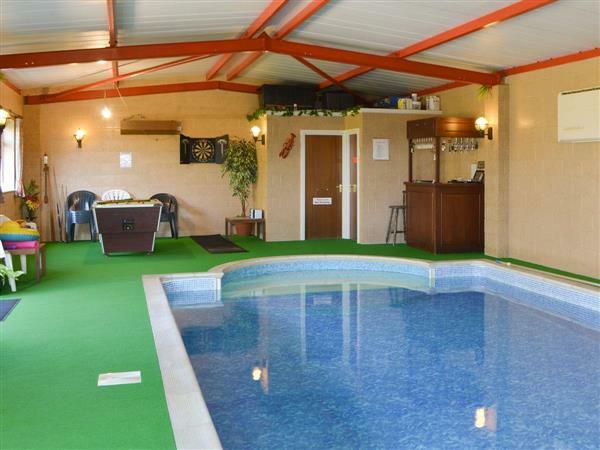 Curlew Cottage is a lovely place to stay for families and couples who want something a little bit different, with the added luxury of a hot tub and lovely pool with changing facilities. There are some nice walks from the door; the Pennine Way runs through the farm itself and Hareshaw Linn Waterfall is nearby. The highly acclaimed International Dark Sky Park, the largest in Europe, is perfect for stargazers and even amateur photographers. Visit the observatory (bookings required) for a chance to spot the Northern Lights. Kielder itself is ideal for cyclists, walkers and those who enjoy the water, and there are visitor centres, a bird of prey centre and plenty of picnic areas. This is a great base for Kielder Winter Wonderland in winter and the Kielder Marathon. Visit Hexham Abbey, only 20 miles away, which is situated in the lovely historic town of Hexham, where a trip over to the Roman Hadrian’s Wall visiting The Sill National Landscape Discovery Centre should be enjoyed. Don’t rule out a trip over to the Northumbrian Heritage Coast, around 50 miles, which stretches for miles with golden beaches and peppered with castles and friendly villages. The Scottish Border at Carter Bar is only 17 miles away, so you can even visit Scotland on your stay here. Curlew Cottage is a great location from which to explore the diversity of this friendly and welcoming county, and no better welcome awaits you than from the friendly owner who respects your privacy but is on hand should you wish to see them. The shop, pubs and restaurant are all 1 mile from Curlew Cottage near Bellingham. Living room: With multi-fuel burner, 49 Freesat Smart TV and beams. Kitchen/dining room: With oil Aga, electric oven, electric hob, microwave, fridge, freezer, dishwasher, 32 Smart TV and tiled floor. Bedroom 1: With king-size bed, 32 Smart TV and en-suite with shower cubicle, toilet, Bluetooth speaker and heated towel rail. Bedroom 2: With king-size bed and 32 Smart TV. Bedroom 3: With twin beds and 32 Smart TV. Wet room: With bath, shower, toilet, heated towel rail and tiled floor. Biomass underfloor central heating, electricity, bed linen, towels and Wi-Fi included. Initial fuel for multi-fuel burner included, remainder at cost. Travel cot and highchair. Garden with patio, garden furniture and barbeque. Woodland grounds. Hot tub for 6 (private). Indoor heated swimming pool (private, 10m x 5m, depth 1m-1.5m, open 7am-10pm) with shower and changing facilities. Bike store. Private parking for 3 cars. No smoking. Please note: The property has a natural water supply from a spring. Holidays at Curlew Cottage run from Friday to Friday. For a better idea of where Curlew Cottage is, you can see Curlew Cottage on the map below. Curlew Cottage is in Northumberland; should you be on the lookout for a special offer, you can find all the special offers in Northumberland. It's always worth checking to see what is on offer at the moment. Do you want to holiday near Curlew Cottage (UK3239), you can see other cottages within 25 miles of Curlew Cottage; have a look to find your perfect holiday location.